Online slots players can play absolutely free and still win big cash prizes. 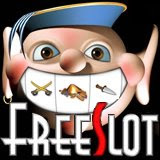 FreeSlot.com is a free casino games site operated by the popular gambling site, Slotland.com. The free site has just added several new features and increased the weekly prize pool. FreeSlot.com runs a non-stop slots tournament twenty-four hours a day. A total of nearly $10,000 in prize money is won each and every week with a top tournament prize of $2000. FreeSlot.com has a special multiplier feature that can catapult free game players to the Top Ten winners circle. The pirate-themed symbols on the FreeSlot.com tournament slot machine include treasure chests, sabres, kegs of rum and, of course, piles of pirate gold. Players are given a limited number of free spins. If their total score for the week puts them in the Top Ten point scorers they receive a share of the weekly prize pool of nearly $10,000. The player with the top tournament score for the week wins $2000. With its special multiplier feature, FreeSlot.com players can find themselves in the Top Ten prize winners more quickly than they might think. Each winning spin multiplies any points scored on the following spin. With consecutive wins, players can win up to eight times the points scored and add their names to the list of cash prize winners in just a few free spins. FreeSlot is not a gambling site. It is a free game where players can win cash prizes. As it is not gambling, it is perfectly legal for anyone anywhere to play at http://www.freeslot.com/, although those under the age of 18 are prohibited from playing for cash prizes. Scores and free spins are reset every Wednesday so a new weekly tournament starts tomorrow.